Solid state materials having quantum properties that can be used, at room temperatures, for storing qubits are leading candidates for use in practical quantum computers. Nitrogen-vacancy centers in diamonds are one promising possibility that has received a lot of attention. However, the right kind of diamond crystals are not easy to grow. Now another material has been identified that may be well-suited for quantum information applications and also has had a number of industrial uses for many years, so there’s extensive experience with its fabrication into large crystals – silicon carbide. Not only has it been used for over 100 years as an industrial abrasive (carborundum), but it’s also a semiconductor already used extensively in the electronics industry. In conventional semiconductor-based electronic devices, crystal defects are often deemed undesirable because of their tendency to immobilize electrons by “trapping” them at a particular crystal location. However, the UCSB team discovered that electrons that become trapped by certain imperfections in silicon carbide do so in a way that allows their quantum states to be initialized, precisely manipulated, and measured using a combination of light and microwave radiation. This means that each of these defects meets the requirements for use as a quantum bit, or “qubit,” which is often described as the quantum mechanical analog of a transistor, since it is the basic unit of a quantum computer. There are more than a dozen promising ideas for technology to implement quantum computers. One of them uses nitrogen-vacancy centers in diamonds. There was recent news about a theoretical study of how this technology could be used to implement coupled qubits. This technology is especially interesting as it can also be used for a closely related purpose: controlled emission of single photons for applications in quantum information networks. Research just published explains how nanoscale diamond crystals can be fabricated on a single chip in an efficient, scalable process. 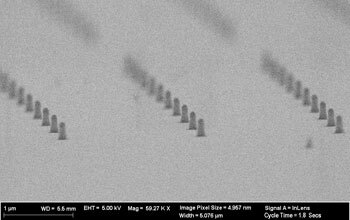 Building on earlier work, scientists and engineers recently developed a manufacturing process that allows them to craft an assortment of miniature, silver-plated-diamond posts that enable greater control of light producing photons at the atomic scale. The research could prove important for future generations of quantum computers. Prior research demonstrated how nanowires carved in impurity-laden diamond crystal could efficiently emit individual photons, an important discovery for using light to rapidly read and write quantum-based data. Now, research shows that novel nanostructures–silver-plated-diamond posts–can also control the speed at which the process emits individual photons. The development supports efforts to create robust, room-temperature quantum computers by setting the stage for diamond-based microchips. In order to make a quantum computer, it’s first necessary to have a good way to implement qubits, the basic unit of quantum information. Although this can be done experimentally with photons or ions at low temperatures, photons and ions are hard to control in practice. 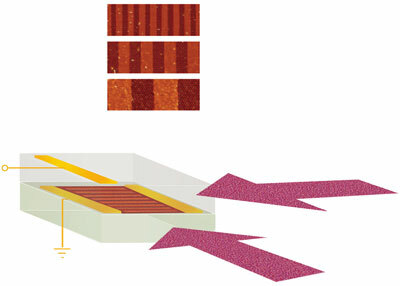 Solid state implementations, using traditional semiconductors, for example, should make control easier, but there are both theoretical and practical difficulties. One related possibility that has received some attention involves a well-known material: diamonds. A specific type of point defect in diamond crystals – nitrogen-vacancy (NV) color centers – may be well-suited for qubit implementation. 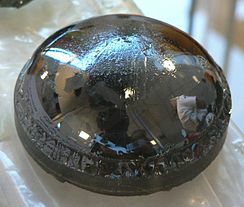 The NV center is a defect in the crystal lattice in which an included nitrogen atom occurs next to a lattice vacancy that would ordinarily contain a carbon atom. Such a defect can emit photons (photoluminescence) under stimulation by electric or magnetic fields. NV defects also have their own quantum spin states, which can be initialized, manipulated, and read optically. The problem of using these spin states as qubits is the practical one of coupling one to another, since isolated qubits aren’t useful for quantum computing. Most of the total spin derives from the spin of nitrogen nuclei, but these aren’t close enough together in diamond crystals to couple effectively. New research presents a theoretical argument for producing indirect coupling of NV sites through electron spin interactions under the influence of an externally applied electromagnetic field. Since the nuclear spin at each site (bearing a qubit) is able to “see” its local electron spin partner via the hyperfine interaction, it follows that if the electron spins at neighboring sites can interact sufficiently strongly, then the two nuclei will be able to communicate indirectly through their electron brothers. While the idea is simple, it turns out to be more complex than one might imagine, in fact, Bermudez et al. start by establishing that the electron-mediated interaction between nuclei at adjacent NV sites will be far too weak to be useful! They estimate that even quite closely neighboring sites, 10 nanometers (nm) apart, will have an effective nuclear-nuclear coupling strength of only 0.1 hertz—requiring several seconds to achieve a useful exchange of information. This is impractical, since nuclear spins suffer dephasing (losing any stored qubit) in less than a second. Happily, the Ulm team has discovered a solution. Their analysis predicts that when the spins are resonantly driven by externally applied electromagnetic fields, the effective strength of the interaction increases dramatically. In essence, they introduce a new energy scale into the problem, replacing the effect of the crystal field splitting (which acts to suppress the effective nuclear-nuclear coupling) with the Rabi frequencies of the driven spins—a parameter that is under experimental control. Remarkably, with a suitable choice for this parameter, the coupling between nuclei is enhanced a thousandfold, becoming entirely practicable as a channel to exchange quantum information. As an added bonus, the act of driving the spins serves to protect the quantum state from the decohering effects of the surroundings. The effect is equivalent to “dynamic decoupling,” in which a spin that is periodically inverted at a frequency faster than the local magnetic field fluctuations acquires an aggregate zero phase. There seems to be a good deal of activity in quantum computing implementations using qubits based on spin states of one or two electrons. Alternative implementations involve photons, ions, or several other possibilities. So far, spin qubit implementations have been lagging somewhat. This is even though there are advantages of using spin qubits, since the implementation can involve solid-state semiconductor technology, which of course is now very sophisticated. 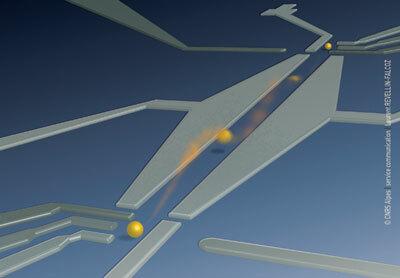 New research now seems to be advancing spin qubit technology. Among the earlier challenges were reading out single qubit states and addressing individual qubits among others in a group. Solutions to these issues has made possible single and double qubit operations. So the next stage is being able to deal with more than two spin qubits at a time in a solid-state system. Over the last decade, the experimental emphasis for spin qubits has been on demonstrating the required criteria for a viable scheme for quantum computing. This has been driven primarily by groups at Harvard and Delft universities. The next stage is to go to higher numbers of coupled qubits and demonstrate more complex quantum gate operations and algorithms. The paper by Brunner et al. is a necessary step forward. It is clear that the spin qubit system currently lags behind other quantum computer implementation schemes. Solid-state based schemes, especially semiconductor ones, have always held the promise, however, that the enormous progress from decades of device integration technology development could one day lead to scalability not feasible with other schemes. To achieve this, however, we need parallel work on spin qubits in different materials to optimize coherence times, device designs, and architectures and to explore hybrid technology based on exploiting the most useful properties of different schemes. Battery technology has a long history, as the first batteries were invented in 1800 by Alessandro Volta. Progress has been continual, but slow. The requirement is to store as much electrical energy as possible in something with the lowest weight, while allowing repeated recharging – all at a reasonable cost. Lithium-ion batteries in general do the best job to date. However, as users of everything from cell phones to portable computers to electric and hybrid cars know, existing batteries either don’t seem to go long enough between recharging or they add too much weight. The need for improvements is becoming even more urgent, since much more battery capacity will be required to store electrical energy from renewable but intermittent sources like wind and solar. The main problem with current lithium-ion batteries is the limited capacity of battery anodes made of carbon. Anodes made of silicon (carbon’s closest chemical relative) could permit the storage of much more energy. However, silicon particles in anodes need to be coated with a more conductive material. Carbon is still being used for this, but due to repeated swelling and shrinking of the silicon during the charge/discharge cycle, contact with the carbon degrades. The new development here is a conductive polymer material that can replace the carbon and still maintain tight contact with the silicon particles. A team of scientists at the U.S. Department of Energy’s Lawrence Berkeley National Laboratory (Berkeley Lab) has designed a new kind of anode that can absorb eight times the lithium of current designs, and has maintained its greatly increased energy capacity after over a year of testing and many hundreds of charge-discharge cycles. The secret is a tailored polymer that conducts electricity and binds closely to lithium-storing silicon particles, even as they expand to more than three times their volume during charging and then shrink again during discharge. The new anodes are made from low-cost materials, compatible with standard lithium-battery manufacturing technologies. New Li-Ion battery to give eight times the power of regular ones? Another week, another interesting development in quantum computing. This time the task addressed is moving quantum information around inside a quantum computer. As usual, the qubit information is encoded in electron spin, so the goal is to move the electrons around without experiencing decoherence that would disrupt the information. Two teams published papers this week in Nature explaining how they’ve accomplished at least part of the task. In both cases, the electrons are moved in a channel on a semiconductor surface, between two quantum dots, spaced 3 or 4 microns apart. The force to move the electrons is supplied by a small piezoelectric actuator. In one case it was possible to move an electron back and forth 60 times, for a total distance of .25 mm. Although the total travel time is less than the normal decoherence time, both teams have yet to prove that decoherence is avoided. Two independent groups of physicists have taken an important step towards the creation of a practical quantum computer by showing how to transfer single electrons over relatively long distances between quantum dots. Both schemes involve using sound waves on the surface of a material to propel electrons between the quantum dots – which are sub-micron-sized pieces of semiconductor. The teams are confident that they will soon be able to show that electrons arrive at their destination with their quantum information intact, making the system a viable “quantum data bus” for a quantum computer. Quantum computers are still in a very early experimental stage. Even the underlying technology best used to implement a quantum computer hasn’t yet been settled upon. The problem is that qubits, the basic objects that a quantum computer works with, are very difficult to control. So it’s not surprising that the larger scale architecture of quantum computers is also not yet determined. Up until now, experimental architectures have not been like the easily reprogrammable Von Neumann architecture of all modern electronic computers. But finally that architecture is being explored for quantum computers. Today, Matteo Mariantoni at the UC Santa Barbara and pals reveal the first quantum computer with an information processing unit and a separate random access memory. Their machine is a superconducting device that stores quantum bits or qubits as counter-rotating currents in a circuit (this allows the qubit to be both a 0 and 1 at the same time). These qubits are manipulated using superconducting quantum logic gates, transferred using a quantum bus and stored in separate microwave resonators. Let’s say upfront that the result is not a particularly powerful computer. Mariantoni and co show off their device by demonstrating a couple of simple but unspectacular algorithms but ones that were carefully chosen as the building blocks of more impressive tasks such as error correction and factoring large numbers. Not that they’ve actually done any of those things. What’s impressive, however, is that they soon could since this approach is eminently scalable. Could this quantum computer be the real deal? Two objects of intense interest in the world of cutting-edge technology – graphene and terahertz radiation – seem to be well-suited for each other, even though no such close connection has been recognized until recently. Terahertz radiation lies in the portion of the electromagnetic spectrum where the wave frequency is around a trillion cycles per second – sandwiched in between the microwave and infrared bands. It has received little attention until recent years, because it is difficult both to produce and to detect. That situation has been changing, and it may start to change even more rapidly. It turns out that graphene – the new wonder-material consisting of single-layers of ordinary graphite – responds strongly to terahertz waves. Graphene responds strongly to light at terahertz frequencies and this could be fine-tuned to make practical devices. That is the conclusion of researchers in the US who believe that their findings could help lead to graphene finding use in a wide range of applications that include medical imaging and security screening. Terahertz radiation lies between the microwave and mid-infrared regions of the electromagnetic spectrum. It passes through clothing and packaging but is strongly absorbed by metals and other inorganic substances, making it of great interest to those developing airport security scanners. However, the radiation has proven extremely difficult to create, manipulate and detect. Quantum computers work with qubits instead of the traditional bits of electronic computers. Most experimental implementations of qubits have used ions – but photons may be a better choice. To date, the most promising approach to building quantum computers has been to use ions trapped in electric fields. Using photons — particles of light — instead would have many advantages, but it’s notoriously difficult to get photons to interact: Two photons that collide in a vacuum simply pass through each other. In the Sept. 2 issue of the journal Science, researchers at MIT and Harvard University describe an experiment that allows a single photon to control the quantum state of another photon. The result could have wide-ranging consequences for quantum computing and quantum communication, the quantum analog to conventional telecommunications. New approaches to quantum computing are announced almost every day. However, almost all of them seem to be at the level of laboratory experiments. UCSB physicists have demonstrated a quantum integrated circuit that implements the quantum von Neumann architecture. 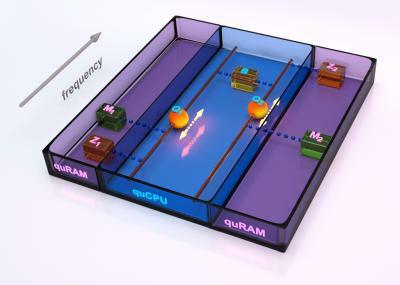 In this architecture, a long-lived quantum random access memory can be programmed using a quantum central processing unit, all constructed on a single chip, providing the key components for a quantum version of a classical computer. The UCSB hardware is based on superconducting quantum circuits, and must be cooled to very low temperatures to display quantum behavior. The architecture represents a new paradigm in quantum information processing, and shows that quantum large-scale-integration is within reach.